Garnet Sand - Mahaveer Mineral, Rajasthan, India. Garnet sand is chemically inert non-metallic minerals commonly found in the natural environment. Garnet has high specific gravity. Its chemical, hardness and durability properties market garnet and ideal filtration media and abrasive media. We also specialize in custom grades of sand and gravel to meet your stringent specifications. Garnet is a naturally occurring gem mineral with uniform physical, chemical, hardness, friability and micro-structure characteristics, which provide the essential properties for filtration and other industrial uses. Applications range from small; single-media filters to technically advance multimedia commercial and industrial systems. 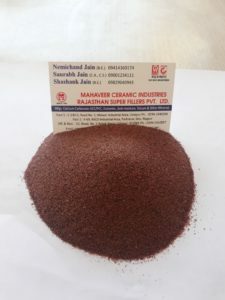 Owing to our in-depth knowledge in this domain, we are specialized in providing Garnet Sand. 1. High specific gravity allows unique filter design. 2. In combination with other filter Medias, higher flow rates, higher loading and better filtration can be achieved. 3. High hardness reduces attrition and provides for years of reliable service. 4. An excellent support bed for other high density Medias.